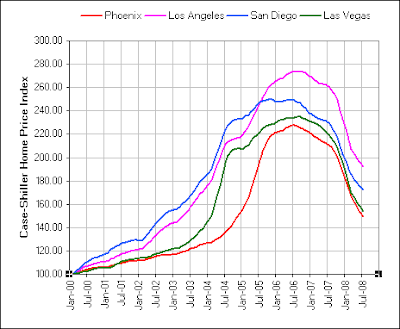 HousingPANIC - The Housing Bubble Blog with an Attitude Problem, 2005 - 2008: Here's the Case-Shiller Home Price Index for Phoenix, LA, Vegas and San Diego. We're back to 2003 - 2004 prices today. Where will it stop? Here's the Case-Shiller Home Price Index for Phoenix, LA, Vegas and San Diego. We're back to 2003 - 2004 prices today. Where will it stop? Wasn't there something about the year-round-golf and pro athletes that was supposed to prevent this kind of thing? "Wasn't there something about the year-round-golf and pro athletes that was supposed to prevent this kind of thing?" Awesome , Keith ! They all look so foolish now for criticizing us here. I hope you keep America Panic going. The Alt - A loans will reset and drown us. That's when we have America Panic. Back to historical average. Reversion to mean, man. I think that means around 1999 or so levels. Mind you, these things usually over-correct so 1995 levels are possible. Then again, there's no telling what the government may do divert, impede and otherwise screw-up the natual processes. Of course, government intervention is more likely to have unforeseen, unintended consequences than those they hope for. I did hear that somewhere before. I think it was a realtor named GREGG SWANN. He's even got a blog. What a smart man. Is that a ink blot - cause I see a pile of Poop. 1998, from wence it came plus a little for scheitts and grins. I'll call 1998/1999 prices non inflation adjusted so the real drop is that much steeper. The great leveling out is here the American economy is returning to the mean. It's not going to grind to a halt and goods and services will still move but deflation is here to stay. No injection of liquidity will fix the REAL problem individual wages cannot support the current costs of commodities and assets (the latter more than the former). It will end in tears back at 1992 prices. If it breaks through 1992 then the next defense is probably 1981. Once we start living like the Waltons with multiple generational families becoming common, the wheels really fall off. 2000-2001-ish. That is when the increase in house prices because of cheap credit first caught my attention. Side note: I saw Obama today under the St. Louis arch. 100,000 strong. It was great, especially if you had binoculars! Just seeing that graph is really shocking isn't it? Just because you know whats going to happen doesn't change the feeling of surprise when it happens. I keep thinking about the masses and their total inability to think. Even now, I get the sense that people would rather die than think about what's happening around them. In other news, Swann is saying that now is a great time to buy Phoenix real estate. Better question to ask is what price is fair? Or what price is a great price? And yet oh, so predictable.. Right back where we started. And maybe, hopefully, people can save up 10%, 'buy' a home for less than three times their income, raise a family, and not treat their homes as ATMs or lottery tickets. Nick- the so called "Fucked Borrower" is awesome. He is sticking it to you HP'ers really good. I am in the same boat as he is. pre-2000, it will over correct before recovering. I did some advertising photography for an ad agency in 1976 near Miramar NAS: new houses were $34,000. Oh, my I said, who could afford that! THAT'S what I will pay; when it rolls back to $34,000, that I will buy back in. And F the banksters if the prices don't get there; then the GD bankster can live in them all. Home prices are a lagging indicator much like unemployment - once the economy starts to recover, housing prices generally lag by one to as many as three years. . .here in San Diego, the 1991/92 recession ended in late 1992, but housing didn't reach bottom until 1995. Considering we are just entering the REAL recession - and likely to last two years, it will be 5 more years until housing prices reach bottom. Unfortunatley its an inflation adjusted index. Reversion to the mean and even an overshoot will still leave us with pricey housing. The dead currency and stagnant wages/ joblessness are going to be very ugly. This may be the new depression. Same as the old depression...but different. Prices in southern california in 2004 were insanely high. I knew several people, including myself who in 2004 decided that our southern california homes were way over valued and we all decided to cash out as we knew once the market got wise and corrected itself, we would no longer have this "false equity." One person I knew sold their home, pocketed 200K and rented a home in Costa Mesa. Another person I knew took their 300K gain and paid cash for a place on Lake Havasu, I similarly took my 300K gain and paid cash for a place in Atlanta. Point being is if prices are only back to 2004 levels, then the market has a long way to go to finish correcting as 2004 prices were considered to be unrealistically grossly overinflated supported by speculation as opposed to normal supply and demand. The I predict prices will fall to at least 2000 levels before leveling off as even in 2000, 30 year old homes around 1800 sq ft if located in a decent white neighborhood was close to 500K which was a major stretch for even families that earned TWICE the area's median income. This is the time when Greg Swann and the realtor scum bawl balefully in private, but will they ever publicly admit they've been incredibly foolish? Look up the median household income and median home value from the 2000 census. When prices fall to that level, the declines *might* stop. Until then, a huge surplus of houses will accumulate. I hope future buyers by the time housing prices correct will be thoroughly disgusted with Alt-A, option ARM, option LEG, zero-down, cashback, etc. Based on this graph, I forecast prices heading back to 2001 prices, at minimum. Because of the severity of this problem, we could be going back to the late 90's price level. 2004 prices are still high as Hell. Have to say the same is true for the South Florida Market..I have been checking homes in my old community and yes, my model that I sold last year is NOW going for what I paid for it originally in 03. I fully expect that by next year that same house will be 02/01 prices..
No end to the carnage in sight. The bubble in L.A. (and most other major metropolitan areas) started in 97. You can thank dot-com money for that. Try starting that chart with 96 as the starting point instead of 2000 and you'll see what I mean. Or just cruise Redfin for a while. In chaos comes order - we're now seeing this natural force correct the housing market. Pumping more money into the system will simply lead to hyperinflation. In the process of buying an REO, about 38 to 40% off 2005 price, which wasn't when the house peaked in 2006. Per the graph, it says 43.5% off peak...so I think we are getting quite close for housing. My in-laws sold their house in Los Angeles (near Pasadena) for $850K in 2007. They're back in the market to buy now and are looking at similar homes now priced at $550K - and have seen homes with more upgrades and larger lots. I strongly believe we go all the way back to early 1980's house prices. This 'gravy train' of credit has existed for the past 25 years. We as a country are choking on it now. Back in the 70's and 80's stores had lay-a-way as an option for purchases, before everyone easily qualified for department store credit cards. In the early 1980's VISA and MASTERCARD, including SEARS credit cards were VERY difficult to get. Including any bank loans. This country is choking on excessive credit, in other words everyone is MAXED-OUT and only the privileged with good credit will be able to use their credit cards. What happens to the GDP? 1999, Because I was trying to qualify for a loan that year. The process was long and very intrusive and I had a good paying job. Lending standards were still very high. i thought boomer equaled greater population numbers,,,how does more sellers than buyers maKE FOR RISING PRICES? "i thought boomer equaled greater population numbers,,,how does more sellers than buyers maKE FOR RISING PRICES? I've been wondering that too. There are about 80 million baby boomers (those born between 1946-1964). Of course, they don't all own property, but how in the world are those property-owning baby boomers going to be able to sell all these homes, condos, townhouses..to only about 40 million Generation X'ers (many of whom seem to live with their parents still) and newer immigrants? Those baby boomers nearing retirement may be able to cash in their equity and "downsize" to a condo. But I don't think they are going to get as much as they have been expecting. There just aren't enough younger people coming up behind them to take these properties off their hands! of the Generation-Xer's have at that point when they may be interested in putting a down-payment on a place? 1999 prices in Vegas might as well be 1989 prices. My cousin just bought a house in Far West Chicago suburbs for the same price it sold for when built...in 1995. Depends. If things go bad, it won't be a price reckoned in dollars, but in bushels of wheat or pounds of salt pork. Best case scenario: 2002-3 prices, adjusted for inflation. The Fed & gov't are doing all they can to prop up the house of cards, and that will have a mid-term effect. Long term? Well, start learning how to tan hides & grow winter wheat. We've been unfairly hard on subprime borrowers, when the bigger bulk of the problem will be coming from higher income earners (doctors, lawyers, etc...) who also bit off more than they can chew - they just put down money on a larger McMansion. "I hope you keep America Panic going. The Alt - A loans will reset and drown us. That's when we have America Panic."